The final day of action at the Primm Valley Resorts NSDA event produced some excellent racing. This was another awesome event put on by the NSDA crew. Keep an eye on NSDN for more on this event in the coming days. Final round video posted 4/22. The second race of the National Sand Drag Association (NSDA) season went off March 16-18 at the Soboba Casino in San Jacinto, CA. Sunny skies and hot temperatures were welcome weather for some great racing action. The NSDA encountered their first incident at the February Soboba Casino event. 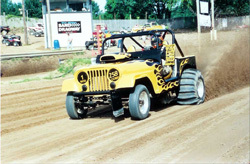 Duane Nosko, no stranger to the sand industry, brought his buggy to the event to be driven by Kris Lauffer. Kris is a record holder on asphalt with some of the quickest and fastest VW race cars. 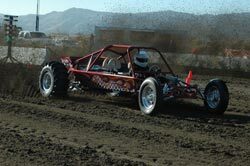 The 2007 sand drag racing season has gotten off to a great start with some stellar NSDA events on the west coast. It never ceases to amaze me how each event the racer turnout seems to grow. This hopefully is a trend that will be seen across the country as tracks in the middle and eastern portions of the country start up for the season. Bill Swim, aka “Wild Willy” is well known throughout the sand drag racing community. The fun loving racer always is a crowd pleaser wherever he goes. “Wild Willy” is in his sixth year of sand drag racing. He started out in the infamous “Wild Willy” T-Bucket bodied altered that brought him to prominence with its wild rides across the country. The altered progressed and eventually pushed well into the 3.5 range before taking a wild ride in Avenal, CA, where it was decided that it was time to move on to a new ride. Shane Sanford started sand drag racing ten years ago with a V-6 dune buggy in Pro 5 and has moved his way up to become a force in the Top Alcohol class. Shane, from Fullerton, CA, always had fast toys and once he got into the sport of sand drag racing the natural progression up the ranks began. After a couple of seasons with the buggy, he moved up into the Pro 2 category with an ex-NHRA Super Comp dragster owned by his dad, Ed. Shane went on to take two Primm victories in that race car. This dragster is still raced on a limited basis by the Sanford’s.